This Saturday sees a cracker inside the SSE Hydro in Glasgow, as the semi-final line up in the Bantamweight version of the World Boxing Super Series will be completed. Fast rising star, and WBA “Super” Champion, Ryan Burnett, meets a man in the twilight of his career, but still very much a live opponent, in multi weight World Champion Nonito Donaire. It’s an excellent match, and one Burnett will be keen to impress in. The winner will meet South Africa’s WBO Champion, Zolani Tete in the next round. The fight doesn’t yet have a UK broadcaster, but can be seen on the WBSS YouTube account. Ryan Burnett is fast maturing into a respected World Champion at Bantamweight. Since his change of trainer to Adam Booth, he has gone from strength to strength. This Saturday he enters the World Boxing Super Series fray, as he meets lower weight legend, Nonito Donaire. After a solid amateur career of 94 wins against four losses, Burnett turned professional in 2013 under the guidance of Ricky Hatton. After Hatton Promotions went through a tough spell without TV coverage, Burnett linked up with Booth. He would take his record to 11-0 before meeting wily veteran Jason Booth for the vacant British Bantamweight Title in November 2015 in Manchester. Burnett knocked Booth down in the opener, and gained valuable experience by settling for a unanimous points win. Three points wins followed, picking up the WBC International Title, as well as making a defence of the British against Ryan Farrag (Unanimous) in October 2016. After a marking time win in early 2017, Burnett challenged Lee Haskins in Belfast for the IBF World Title. Burnett dominated from start to finish, with Haskins down twice. 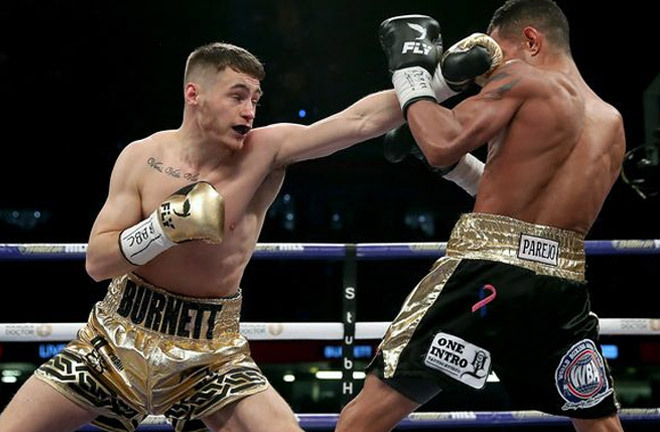 The fight was originally bizarrely announced as a split decision, due to one of the judges mis-judging the correct boxer, but thankfully was eventually changed to a wide unanimous decision win to crown Burnett World Champion. He unified in his next fight with a lively win over Ricky Hatton trained Zhanat Zhakiyanov, again at the SSE Arena, Belfast. Burnett again won handily on the cards to add the WBA “Super” belt to his ever growing collection. He has fought once since, on the Anthony Joshua v Joseph Parker bill in Cardiff. He relinquished the IBF Title, and outpointed Yonfrez Parejo. He is likely to face the stiffest examination of his career this Saturday night. 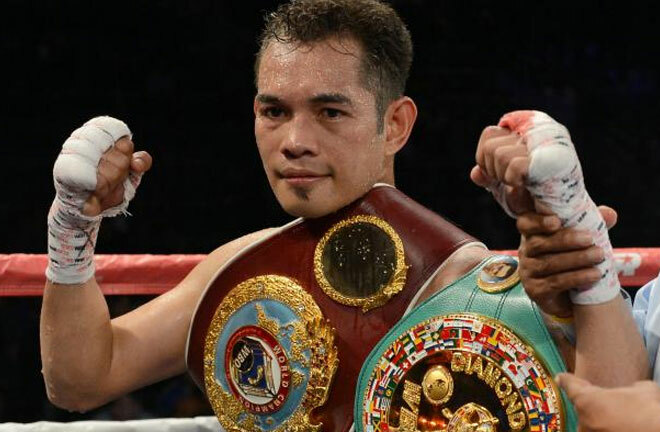 “Filipino Flash” Nonito Donaire is now 35 and at the back end of an illustrious career, but he will still come to Glasgow this weekend intent on one last hurrah. He has been a professional since February 2001, and lost in only his second fight. It wasn’t until July 2007 that he came to wider attention. He challenged the then 28-0 Australian based Armenian, Vic Darchinyan, a feared puncher riding high in many mythical pound for pound lists at the time. Donaire ripped the IBF and IBO Flyweight from Darchinyan with a spectacular fifth round stoppage win. He made three Title defences, before winning the Interim WBA Title at Super Flyweight, outpointing Rafael Conception in August 2009. Three more wins followed, before a move to Bantamweight where he stunningly stopped Fernando Montiel in two rounds to pick up the WBC and WBO Titles. Donaire won every round in defending his WBO Title against Omar Narvaez, and then moved to Super Bantamweight to win the vacant WBO Title with a split decision win over Wilfredo Vazquez. Donaire had his man down in the ninth, won 117-110 on two cards, but somehow the third judge scored 115-112 for the Puerto Rican. He made three defences before meeting Cuban amateur starlet Guillermo Rigondeaux in a unification fight. Donaire suffered defeat for the first time in twelve years as Rigondeaux won unanimously in a hard to watch contest. Donaire then re-matched his now faded old foe Darchinyan in November 2013, this time at Featherweight. Donaire was well behind in a ten rounder, four points down on two cards, before finding the equaliser to knock Darchinyan out in nine. He picked up the WBA “Super” Title on a technical decision, suffering a bad cut ending his contest with Simpiwe Vetyeka in five rounds, Donaire winning on the scorecards. Donaire’s progress was derailed in October 2014, as the Jamaican Nicholas Walters wrenched away his Title in six rounds, dropping Donaire three times. He rebuilt with four straight wins, including winning back the WBO Super Bantamweight Title, before losing this in a lacklustre display against Jessie Magdaleno at the back end of 2016, dropping a wide decision. He took ten months out and moved back up to Feather to outscore Ruben Hernandez. 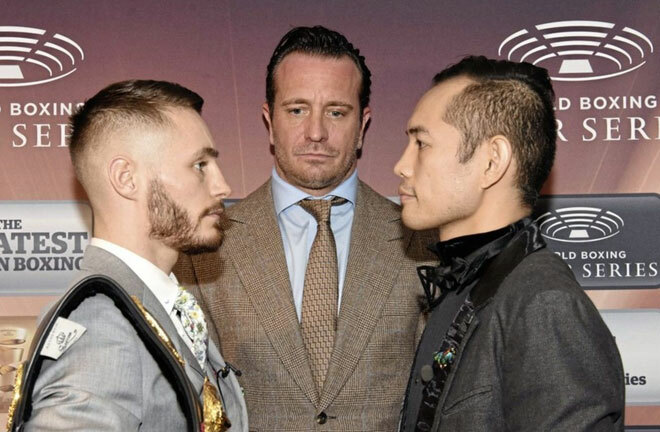 In his last fight, in April this year, he put in a spirited effort in a losing effort to Carl Frampton in Belfast, showing he had chinks of his old self. I think Burnett will encounter early problems from Donaire, who will likely look to end matters early, and use his once blurring speed. Donaire doesn’t carry the power at the higher weight though, and I expect Burnett to take over in the middle and late rounds to secure a comfortable enough points victory, but he will be made to work hard for it.